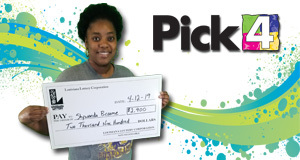 Shywanda purchased her winning ticket at B-Quik on Greenwell Springs Road in Baton Rouge! She said she's a regular player and has won playing Pick 4 in the past. She plans to use her winnings to pay bills. Congratulations!